The Note series has a long history behind it. The success story started in 2011 with the first Galaxy Note that created a new category of devices and coined the term ‘phablet’. In short, these are smartphones with large dimensions, or at least dimensions that are larger than the other smartphones on the market, but also still smaller than tablets, which back in the day were more popular. The Notes were conceived as devices designed for professionals, for users struggling with multitasking in general, and last but not least, for gamers (why not?). The original phablets reached important milestones (1 million units of the original device were sold after just two months on the market, to name just one) and proved time and time again to be well-made and high-performing. Expensive? Yes, but for a lot of users they were worth the investment. Those of you who had a Note 4 know very well what I’m talking about and devices from the Note series have never been easy to replace, especially if you consider the Note 5 was only released in selected markets and the explosive end to the Note 7. The Note 8 can be thought of as the first true successor for Samsung. I still remember the enthusiasm that the Note Edge generated. It’s the only one of its kind with the curved display. Along the right side you can quickly access your favorite apps, notifications, weather, the time and pedometer. It was beautiful and unique. Sure it was pricey, just like all members of the Note family, but it’s still interesting and exciting. It’s reason enough to save for the device (and to not invest in any other device). The Notes aren’t as charming as they used to be. Has the world of smartphones changed? To me, things are somewhat different nowadays. The Notes don’t really cut it anymore. Phablets aren’t a fad anymore. The smartphones on the market are almost all phablets: the displays are getting bigger and better optimized and are housed within light and thin frames. There are hardly any bezels anymore, and the infamous notch has found ways to house the front camera and sensors (Vivo and Oppo use special mechanisms for the camera, much to the pleasure of notch-haters everywhere). So what about the Samsung Galaxy Note series? 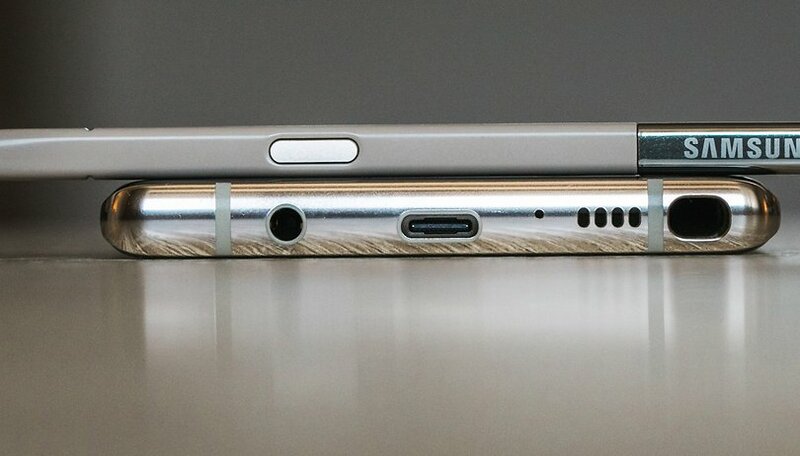 Yes, it has the S-Pen, which others devices don’t have. But I don’t need a pen everyday. It might be fun for a while, but let me be clear, it’s not really a feature that I need for a smartphone. The S-Pen doesn’t make me more inclined to buy a Galaxy Note rather than another device. The S-Pen surely wasn’t what convinced me to wait for the Note 9, which according to the latest rumors, will make it smarter with new integrated features. Beyond these new features, the Note 9 shouldn’t be a surprise on the design side. It integrates Android Oreo and a processor from the last generation that will surely offer excellent performance, but that’s what I expect from an expensive flagship in 2018. The device will probably use version 2.0 of Bixby, which manages to be a little more useful, but I’m more than satisfied with Google Assistant and don't feel the need for an additional dedicated button. Perhaps people have lost interest in the Galaxy Notes since the Note 4. Although the Note 8 did have some success in the US, Korea and Australia, it had a poor show in other important markets, especially Europe. Or perhaps it’s simply the result of the evolution of smartphones, the arrival of new competitors on the market and the success obtained by alternative phablets that perform just as well, such as Huawei’s Mate line (though it comes without a pen). But to return to the Note 9, it will face some tough competition from a rival device from Honor. Honor’s originally named Note 10 device won’t at the same level, technically speaking, but it’s certainly cheaper. Personally, I’m more excited to get my hands on smartphones like the new Vivo Nex, to try the triple camera on the Huawei P20 Pro or the retractable camera on the Oppo Find X. I’d also like to try out the Nokia 8110 4G, the Nokia 8 Sirocco, and take a look at the patents on the foldable devices coming from Samsung and LG. Chinese brands are making the smartphone market more interesting and I’m happy about it. And mid-range devices have become more and more elegant and have adopted exclusive features that were once reserved only for high-end devices. I think that many users will become more interested in mid-range devices, especially if you consider the impressive benchmarks some of these devices are reaching now. In short, I don’t have any real reason to wait for the release of the Note 9. But if you’re eyeing the pen, you might have a different idea. Surely the launch event will be as exciting as all the Unpacked events that Samsung has organized, and without a doubt, it will be a great device on the hardware side and it will offer good performance. But it’s not exciting or special enough for me to think: “that smartphone will be mine”. Are you still faithful to the Samsung Note series? Are you anxiously awaiting the release of the Note 9? If you are, please let us know why in the comments! I am still useing my Note 4. I love the S-pen but would not be able to do my work with out swaping batteries. Currently useing numbers 3,4 and 5 in the rotation, the last Great Samsung will probably be replaced with one of the upcoming Linux phones so that I may find a value worthy of giving up the S-pen. Im still using Note 7 and waiting for it to explode which luckily haven't(it was a replacement with green battery icon). Performa nce is still great, and although I rarely use the s-pen, its still a great novelty and only use it when I send digitalized greetings to my friends using my handwriting(such as bdays). The upcoming Note 9 was leaked to have a price north of PhP50k here in our country or $1100, which is sad to say is too much for me. If I really wanted to upgrade to this device I'll probably wait for a few months for a better deal. It won't. That was greatly over exaggerated. "Note 9? Give me a reason it's worth waiting for"
If someone started a thread in a forum with this line they'd call him a troll. -Give screen an as close to 16:9 ratio as possible. It's a notebook, remember? -Leave the 3.5 mm jack on. Most of the above are not going to happen in the near future, and that's the reason I won't buy a Note anytime soon. If sales keep going down, maybe Samsung will reconsider. The Notes used to be a niche device, their downfall came when Samsung tried to turn them into to mainstream. Of course it will be a great device. I just do not know why you compare it to Chinese telephones. You can match them to the Galaxy A series and not to Note. It's like there's a phone to offer more. It's not even interesting !? No need. This site looks like it is chasing Samsung in recent days. This article is so committed to speak badly of note 9 that neither had the job of citing the 4000's battery rumor. She scorns Spen but is loving the phones of Vivo and Oppo with their outdated Full HD displays. 4000mah battery. That's really all that needs to be said. Samsung has neglected to increase the Note battery to a proper size, only concentrating on the wrong way to make the device smaller (e.g. Note7 fail). Give credit where credit is due! It's so funny to me, to see all these blogs discussing how Samsung "failed" with the S series and Note series this year, yet NOBODY has pointed out that this has been Samsung's patterns for multiple years! Look at the significant design changes with the Note series. Original Note to the Note 2 was a significant change, Note 3 was slight change (but needed one). Note 3 to Note 4 was a slight change. Note 5 drastic change, Note 7 slight change (even though it was recalled). Note8 was drastic change, Note 9 is slight change (but needed one with battery increase and fingerprint relocation). So, before everybody jumps on this same narrative, how about you look at the history and point out the fact that this is nothing new for Samsung. They've been doing this for years, so there's really no big surprise at all or any reason to spew negative attacks at Samsung now, if you hadn't already been giving them crap since early on with the Note series (and S series as well, even though I didn't go over the drastic vs. slight changes on that series). A bigger battery doesn't necessarily equate to better battery life. It's a feeble attempt to duplicate the walled garden of Apple but in the open Android environment that is designed to break down walls. It's simply unsupportable business concept for very long. Note 9 sales will disappoint. The Note line is redundant. Just give the S9+ a pen and that should do the trick. Not really. The Note isn't the same. Some feature are similar but not the same. I love the Note series! I loved the Note 4 but it lacked features that I now have in the Note 8. Other phones are enticing, but what I get with the note 8 I can't get with any other phone. So I totally disagree with your opinion. Since I just purchased my Note 8 a few months ago I am not looking for the note 9 to purchase but I'm interested in what it has. personally I cannot do without the S Pen but I can do without Bixby. Me too, I love the note series. So it will look like the note. That's no big deal. Still one of the best designed phones on the planet. The 4000mamp battery holds the most interest for me! You should try Bixby, the command are awesome.